Everything listed is verifiable and the policies Labour passed can be found up on the parliamentary website, along with a variety of other sources, some cited on the article, which can be found with even a very basic google search. If you can’t present reasoned comments and evidence, you haven’t got anything worthwhile to say. Whether you like it or not, the list is fact. You dismiss fact because it doesn’t fit with your ideology. That’s too bad. Get as irate as you like and rant away, that won’t change the truth. Hey! You were ahead of the game – they didn’t listen though. We do need to remind people, because the Conservatives are trying to re-write our history. And succeeding. We mustn’t forget what Labour is about. I wish it didn’t look like the labour party, or at least the leadership, weren’t putting up any fight to retain those great achievements, explaining how spending on them didn’t cause the credit crunch, and vowing to undo the nastiest of the coalition’s changes. 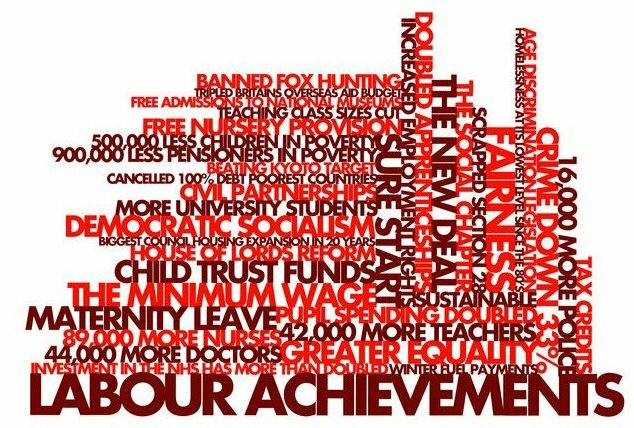 But, it’s a timely reminder of what labour did in office, though it’s worth noting,as Polly Toynbee likes to point out, Labour kept very quite about much of it. Now put the tories achievements side by side. A short list thats for sure. And just to ram it home ,miliband must hammer the tories nonstop that is was thier friends the BANKERS who brought this country to its knees, not labour. 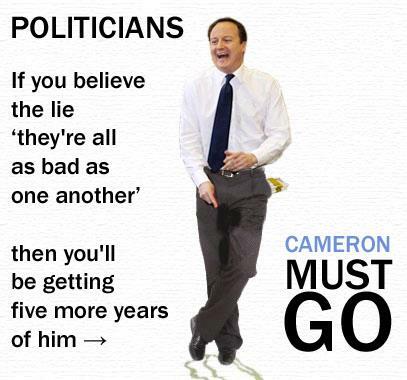 Take a leaf out of the tory book and lie like hell to get elected, and shut balls up. It wasn’t the people who voted in this coalition – it was the people who didn’t vote! I hope that it doesn’t happen next year as the thought of another five years of this inept and cruel lot is unbearable! And the lowest teenage pregnancy rates for 40 years. Labour’s teenage pregnancy strategy was an excellent well evidenced project. We should shout about it much more. Yes, I was a youth and community worker at the time, and delivered informal ed programmes under Every Child Matters, in schools and provision as a detached worker on the streets. It works. Abolition of the hereditary peerage. Its a start.. No use waiting for the revolution. We can’t suffer another 5 years. Vote Labour to kick the Tories out. It’s worth looking at those to see how many have been reversed completely within 4 years of a Tory Government. We need Cameron out for good and constitutional change to prevent the Tories ever reversing Human rights and the NHS Charter. That graphic was produced by Rory Doona for one of my leaflets!! Reblogged this on Julian's musings. Reblogged this on Autumn leaves. Any comments now in hindsight of where we’re at now…….? Well, we moved on from the neoliberal economic framework that Blair favoured. In fairness, Blair did ensure that social policy provided a safety net to protect us from the ravages of neoliberalism, but it wasn’t perfect by any stretch of the imagination. There are lessons there, anyway. Positive ones to draw on, as well as the negative. Interesting to see the Tories drive to dismantle Blair’s policies – such as the Human Rights Act, Equality Act (mostly Harman’s work), fox hunting ban and so on. Without the first two, and without the fact that Blair signed us up to the convention for the rights of disabled persons, it’s sobering to consider that we would have no legal framework from which to effectively challenge the discriminatory Tory welfare policies. Reblogged this on Road less travelled.